I caught up with Mark Cousins whose film The First Movie was being screened last night at the QFT. He took his mobile cinema to a northern Kurdish village in Iraq. Handing out digital cameras to the children, their highly creative filming (including “a continuously held camera shot … [a] revealing fable of a boy who, without friends or toys, [who] confides his hopes, dreams and thoughts to the mud) is included in the war zone documentary, as Cousins reflected on his own childhood in Northern Ireland. On the last full day of the Belfast Film Festival, Mark Counsins was part of a panel discussion held in conjunction with Index on Censorship looking at Making Political Films About the North: Then and Now. “The troubles in the North of Ireland have long been the subject of film-makers. This film-making landscape has changed over the years, as has the political landscape. Self Censorship and direct Political Censorship have both been key factors in defining what films get made and which ones don’t. The panel will discuss selected issues relating to censorship. At some level I’m a Guardian reading liberal at heart. Except, now that I’m not spending as much of my life in airline lounges, I’ve ditched my regular plunders through the paper copies of the Guardian, Independent and Evening Standard. I only read the media and technology sections of the Guardian online. And sometimes, I don’t even read it online but suffice with a quick listen to their Media Talk and Technology podcasts – which I heartily recommend. For the first few years, I had no copyright statement on this blog, and all my photos on Flickr were labelled with All Rights Reserved. In the last year or so, I took the step of switching to adopt a Creative Commons licence. Working through CC’s licence selection wizard, I felt generous towards other bloggers and socially network types and normally don’t mind if other bloggers quote liberally from my posts. (In fact, I formally allow a couple of syndication sites to reproduce entire articles.) But in general, I want my words and pictures to be acknowledged. So my Flickr photos sit under an Attribution-Non-Commercial-No Derivative Works 2.0 Generic licence (usefully shortened to BY-NC-ND), and the blog under a related Attribution-Non-Commercial-Share Alike (or BY-NC-SA) licence. Attribution — You must give the original author credit. (in the case of Flickr only) No Derivative Works — You may not alter, transform, or build upon this work. (in the case of the blog only) Share Alike — If you alter, transform, or build upon this work, you may distribute the resulting work only under a licence identical to this one. But it was only when one of my photos recently appeared in an Irish weekly publication that I realised I had misinterpreted the phrases “non-commercial” and “derivative works”. And I bet I’m not alone. Commercial doesn’t mean an organisation which makes money. It’s a more specialist definition: “used for advertising, endorsing or promoting a product or service”. If a newspaper uses your photo to illustrate an article, that’s editorial not commercial. If an advertiser uses it, that is commercial. Surprisingly, editorial includes the front cover of books and CD covers. Turns out that cropping a photo doesn’t create a derivative work. Non-Derivative means that they can’t take the image, cut bits out, add bits to it, or change the fabric of the image. Thanks for @stepbar for his rapid explanations and education. And thanks to the publication in question for resolving the matter so quickly and easily. Wednesday evening was going to be a celebration of locally-shot and produced film Cup Cake which was showing on the Dublin Road as part of the Belfast Film Festival. Baking in Ballymoney – who would have thought! The screening was sold out, but hopefully the film will be shown again later this year. Maybe the QFT will give it a week’s run? So I headed up to the QFT and was just in time to catch Lebanon. Other than the matching opening and closing shots, the entire film is shot inside the tank. 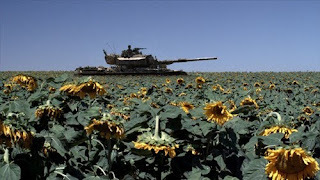 Over 90 minutes you see the four Israeli soldiers as they get progressively warmer and grubbier during their day long military operation. The outside world is solely observed through the gunner’s viewfinder, the driver’s optics, or by peering up though the rooftop hatch as visitors come and go. The backing music is sparse, but the sound track is superb. As the tank's hatch was slammed shut, it sounded like the whole roof of the QFT cinema had been dropped down above us. The context is the First Lebanese War in June 1982. The inexperienced and quarrelsome tank crew provide cover for a small group of troops as they search for remaining fighters in a previously bombarded area. The driver Yigal is very young and this is his first experience of war and he's anxious that his parents are told that he is well. He hasn't yet learnt that there's "no such thing as a dead tank". Hertzel, the artillery loader, is junior in rank and endures the most physical role in the metal box on wheels, but perhaps has the most experience. His officer Assi fails to command the respect of the crew and gradually falls apart under the pressure of the day. Meanwhile the gunner, Shmulik, has never fired live rounds before and freezes instead of destroying an oncoming vehicle. He comes face to face with the consequence of his inaction – a dead soldier (referred to as an "angel" on the army radio) killed by the escaping enemy is lowered into the tank to remain until he can be evacuated by helicopter. The mission’s commander Gamil sounds confident when he pops into the tank to brief them, but a possible lapse of judgement leaves them in peril. Reminding the crew that international law prevents them from using phosphorus grenades, he explains that he refer to them as "exploding smoke" if they are needed. 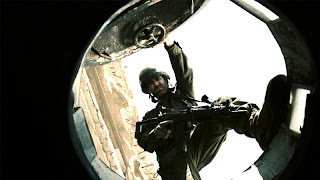 The film Lebanon provides a similarly constrained window onto the fog of war, seen only from the restricted view of a tank. Like the New Baghdad incident, there may have been other perspectives, other incidents nearby the same day, other factors to consider. But the men trapped in their tank don't see that. A lack of information, fear of apparent danger, and a lack of confidence in the command chain all lead to incomplete instructions and bad decisions. Yet in the face of death and panic, there are some moments of humanity. A mother whose children have been caught up in the conflict is eventually treated with dignity. A Syrian prisoner of war is cared for. The crew slowly open up and relate to each other ... but when left lost and abandoned, will it be enough to see them through? A dark subject matter, but a film worth seeing for its unusual setting and the complex characters involved. One last thought. Toilet facilities in tanks are primitive, but the film's soundtrack is graphic. There was a steady trickle of older gentlemen running out to the loo as the film progressed, and quite a queue at the end. Go before the film starts! Belfast Film Festival continues until the 30 April. Much of the political focus is on Westminster at the moment as candidates pound the pavements delivering election literature through our doors (so far always when I’m out). But up on the hill, MLAs are still debating Café Culture (or "Tiocfaidh ár latte" as Keith Belfast refers to it) and making St Patrick’s Day a public holiday. These 108 particles are held together by forces called morons, which are surrounded by vast quantities of lepton-like particles called pillocks. Since Stormontium has no electrons, it is inert. However, it can be detected, because it impedes every reaction with which it comes into contact. A tiny amount of Stormontium can cause a reaction that would normally take less than a second, to take from 4 days to 4 years to complete. Stormontium has a normal half-life of 2 to 5 years. It does not decay, but instead undergoes a reorganisation in which a portion of the assistant neutrons and deputy neutrons exchange places. In fact, Stormontium's mass will actually increase over time, since each reorganisation will cause more morons to become neutrons, forming isodopes. This characteristic of moron promotion leads some scientists to believe that Stormontium is formed whenever morons reach a critical concentration. This hypothetical quantity is referred to as a critical morass. When catalysed with money, Stormontium bonds with Administratium (symbol=Ad), an element that radiates just as much energy as Stormontium, since it has twenty times the number of pillocks but half as many morons. Administrative pillocks are characterised by an aversion to using up energy. In fact the more pillocks there are in Administratium the less energy they use. The scientists concluded that in its present form there were very few practical uses for Stormontium. The Linen Hall Library continue to run a children’s reading time once a month on a Saturday morning. Once you get over reading out loud in a library, there’s something magical about sitting in the shadow of the tall shelving of books. You don’t have to me a member of the library and it’s free. Bring your 4-7 year old along and enjoy. Click, Clack, Moo: Cows That Type tells the story of Farmer Brown’s cows who find a typewriter and set out their demands for better conditions (electric blankets). They go on strike and appoint a duck as a go-between. It sounded frighteningly like the politicians and governments up at Hillsborough. Perhaps this should be on the reading list of all Westminster candidates (and next year’s Assembly hopefuls). The kids version of Negotiation 101. Next sessions at 11am (sharp) on Saturday 22 May and Saturday 19 June. May’s event is being organised in association with Belfast Children’s Festival. Come in Alice in Wonderland fancy dress (prize for the best one) hear lots of stories and finish with the Mad Hatter’s tea party. Eating and talking in a library - a rare opportunity! Booking required for May's event only - 028 9032 1707. Fewer planes, more trains and automobiles? It's been a strange week. Normally I'm the one in the house who does the flying around. At least that's the way it used to be. Three or four days a week, I'd be away. I normally treated catching a plane to England with all the respect I'd give to catching a bus. It got me from A to B. Occasionally they'd be late. One got de-iced before they’d closed the doors and the French pilot yelled some choice Anglo Saxon out the open door to get them to stop. There were the two nights in the last ten years I've spent sleeping on a bench in Heathrow Terminal 1. One plane aborted its take-off. Twice I’ve turning up for early morning flights that a corporate travel company had forgotten to pay for. More recently, one plane’s door wouldn't close and I turned up six hours late for my own meeting. But in general, I viewed planes as being more reliable than buses or trains. This week I wasn’t the one in the house travelling. So while I was discovering the joys of walking Littl’un to school and then catching a train into work, I wasn’t the one stuck in Brussels on Thursday night with no flight home. I tried to figure out a rescue travel plan – Eurostar from Brussels = fully booked; Eurostar from Paris = fully booked; first seat on a Paris-Belfast flight on Sunday evening = now cancelled. But I’ll not be the one stuck on a sixteen hour ferry crossing (no berth) on Sunday night, nor chugging on the train to Dublin and up north to Belfast. Nevertheless it’s shaken my normally relaxed attitude to air travel. UK and Irish airspace has been shut down this week longer than immediately after the 9/11 attacks. Longer than Air Traffic Control strikes. The natural but violent phenomenon of a volcano a long way away in Iceland is casually wafting its ash into the atmosphere above our heads like a smoker tipping their cigarette and the wind blowing the ash into your face. What’s never happened before (to us) has happened. And it’s flummoxed us. Travellers are bamboozled. Many people have no idea how to start planning to get home. They rebook onto the next flight. In turn it’s cancelled. And they rebook again. Hearing news reports from around Europe, I sense a lack of survival instinct to drive some travellers to find ways home that aren’t doomed to further cancellation. What did we do before low-cost flights? It’s also obvious that some travel companies are better prepared that others. Having learnt their lesson during the many cold snaps since Christmas, easyJet’s website very quickly and easily points passengers to the current flight list to see which ones are still marked as Operating and which ones have been Cancelled. Ryanair have sensibly cut their losses. 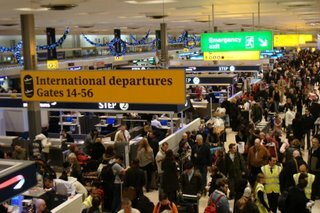 It’s obviously cheaper for them to stand down crews and check-in staff, cut the volume of calls to costly call centres and reduce the churn of booking and rebooking by simply cancelling flights for a 48 hour period, rather than running a creeping 12 hours at a time window of cancellations. On the other hand, Eurostar’s website was struggling to cope on Thursday afternoon and evening. While the early screens would show availability of fares for various trains, by the time you progressed through the next parts of the ordering journey to specify the name of the passenger and whether you wanted marketing emails and text messages, there were no seats to book. Their call centre (naturally) took time to draft in extra staff and for a long time, it just turned away callers with a polite message. Wonky website. Incommunicado call centre. Frustrated travellers and bookers. I loved the story that workers at Belfast City Airport took advantage of the closure to repaint lines on the normally difficult to maintain runway. The volcano’s not going away. It’ll smoke and belch for days or weeks or months. The wind will change and the jet stream will blow ash into someone else’s face for a while. Flybe will realise that their small fleet of turbo props fly at lower altitudes and can charge a premium to those who can afford to pay to be transported on short fuel-thirsty domestic hops. And we’ll all travel by plane less. 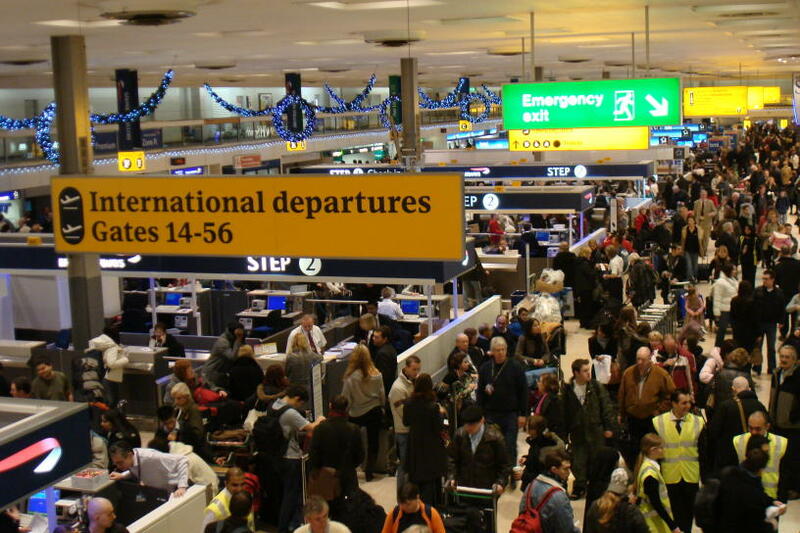 Last year, the economy encouraged people to holiday closer to home. This year, an unpronounceable volcano will further diminish the fly-drive market and boost sales of rooms in Scottish B&Bs and nights in caravan parks. Update - Alain de Botton sums up the possibilities nicely on the latest podcast from Radio 4’s Today programme. Me? I’ll just be glad when our family is hopefully reunited on Monday evening when a tired and crumpled traveller makes it home four days late from a three day trip. And I’ll check the small print of the travel insurance as well as the trans-Atlantic sailing timetables before she jets off to the US in June! PS: I think we should arrange some kind of rota to keep an eye on Slemish. Wonder if any of the North Antrim candidates would like to work that policy into their campaign? PPS: Belfast Film Festival is now on. Lots of good stuff to go and see! PPPS: The Prisoner on ITV looks a bit rubbish. Pity. PPPPS: Bet there’s not a lot of room on Sunday night's ferry for antics like the video below, captured this summer on the way back into Larne! I stumbled across a great 15 minute documentary on pirate radio this evening. I've still to figure out the real reason why Palladium - a shoe footwear company - felt this would be a good use of their marketing spend, but I'm glad that they did. If you want to apply for a postal or proxy vote, then you have until your convenient Electoral Office doors shut at 5pm on Thursday 15 April to get your signed form in along with the evidence that you'll not be able to make it to your polling on the day. They've tightened up on the rules again, so make sure you read the guidance on the first page. If you're not already on the electoral register, then you need to get your form filled in and identification accepted by the Electoral Office by 5pm on Tuesday 20 April. A spin on the Belfast Wheel - for anyone who missed it! Update - click through onto the Vimeo site to watch it in HD. For those who are curious, one Flip camera looked out the front while a second looked out the back, and the two HD views were synchronised using a click of the fingers on the two sound tracks. You can hear strains of Ian Paisley preaching out the front of the City Hall. There’s a slightly longer edited version on Vimeo. Feel free to get in touch if you have a good use for the original HD footage! Digital Economy Bill – third reading – and guess who turned up to say No one last time? There was a flurry of activity around my post last night about the second reading of the Digital Economy Bill and I had an unexpectedly robust exchange with my local MP on Facebook. The new clause allows the Secretary of State for Business to order the blocking of “a location on the internet which the court is satisfied has been, is being or is likely to be used for or in connection with an activity that infringes copyright”. SDLP MP Mark Durkan was also over in Westminster, though no confirmation that he attended any of the second reading in the chamber. For the third reading, we did have a Northern Ireland MP in the Commons. And he voted too! Now that the date of the General Election has been announced and the Prime Minister has gone to ask the Queen to dissolve Parliament on the 12 April, there are only a few days of business left. The main parties met to agree how to accelerate the completion of some of the pieces of legislation already going through Parliament, chopping out contentious clauses to speed up their passage before Parliament is adjourned on Thursday 8th. The technical term is prorogation, but after that there will be no further business until the formal dissolution on Monday 12th. On Tuesday, the House of Commons considered the second reading of the Digital Economy Bill, the majority of the legislation that came out of the Digital Britain report published in 2009. Some sections were scrapped, including those around the creation of Independently Funded News Consortia (IFNCs) - a subject close to the heart of UTV (who are the preferred bidder as Wales Live to run the Welsh trial). But the bill still contains many issues of which members of the public - like you and me - have concerns about: online copyright infringement, forcing ISPs disclose details of customers who repeatedly are accused of infringing copyright (ie, download torrents), radio spectrum allocation, Digital Switchover for Radio (DAB), Broadband access and speeds, as well as the public service remit of ITV, Channel 4 and Five. Hundreds wrote to their local MPs. many receiving warm responses. Some great lines from the debate - which I present entirely out of context. "We wanted an iPod, but we got an Amstrad. We wanted digital switchover, but we ended up with analogue switch-off. It is time to reboot Britain, and only the Conservatives can deliver that." "The best way to illustrate this is by means of an old-tech linear-medium metaphor. In this metaphorical world that they have constructed, my hon. Friend the Member for West Bromwich, East (Mr. Watson), who is in his place but not paying attention, is Luke Skywalker. He is the little guy, the plucky loner fighting the machine. Clay Shirky is Obi Wan Kenobi, the wise, broad, almost mystical guru figure. Peter Mandelson is obviously Darth Vader. Rather more counter-intuitively, however-this is where the metaphor begins to fracture-the evil Sith Chancellor Palpatine, the most evil universally bad figure of all, turns out to be Steven Spielberg. That is who Luke Skywalker is fighting-the ultimate rights holder, the acme of creative content ownership. When Spielberg turns out to be the ultimate evil, we know that the metaphor-otherwise quite cleverly constructed by the freedom fighters-is not just flawed, but misleading, damaging and dangerous. When Spielberg is the ultimate evil, it turns out that creativity is the enemy. It is creativity that Luke and his pals are after." 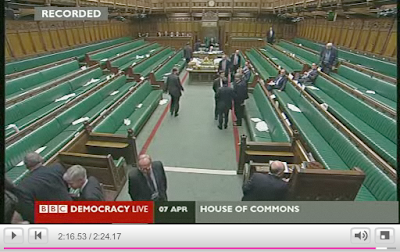 During the 6 hour debate, no Northern Ireland MPs spoke, and from flicking through the footage of the session, I can see no evidence that any local MP was in the Commons during the debate. Update - Jeffrey Donaldson (see below) was quick to suggest otherwise. Broadband access, ITV's public service remit (UTV's franchise), Digital Radio - all relevant to Northern Ireland, but no representation at this stage of the bill. Today, another bill affecting Northern Ireland was before the commons - the Northern Ireland Assembly Members Bill - which means that MPs or MEPs who are also MLAs will not receive an MLA salary (a step on the road towards eliminating dual-mandates) as well as permitting the Northern Ireland Assembly "to delegate the determination of salaries and allowances to an outside body" (something they plan to do after the 2011 Assembly elections). During the 50 minutes this bill was before the Commons this afternoon - which you can watch on BBC's Democracy Live website - three Northern Ireland MPs (all of whom are also MLAs!) managed to turn up and speak: Peter Robinson (DUP), William McCrea (DUP), Mark Durkan (SDLP). When it was about money and jobs, a few managed to make it across to London to speak up. 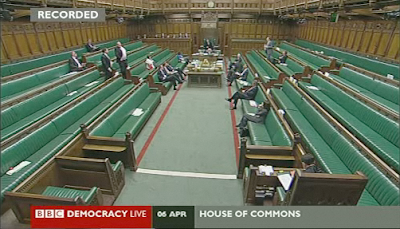 Maybe our budding Westminster candidates will commit to better attendance in the next Parliamentary session? Jeff Peel has some words to say on the same subject too. "That is totally untrue. I was present at Westminster all day yesterday together with Peter Robinson, William McCrea, David Simpson, Gregory Campbell and Sammy Wilson. I attended several meetings in the House of Commons during the day and was present when the Speaker called for the vote on the Digital Economy Bill. No division occurred. As far as I know the DUP was the only local party present." Update - The SDLP's Mark Durkan was also in the building, though not sure how much/little of the debate he sat in on. Oh, and someone turned up at the end of the third reading to vote No! Two weeks of comedy, theatre, music and more will soon be coming to the triangle between Belfast’s Arthur Square, Custom House Square and Writers’ Square (opposite Stan’s Cathedral) kicks off on Thursday 29 April. Along with the Out To Lunch sister/warm-up festival held each January, the Cathedral Quarter Arts Festival is always a treat. What caught my eye in the programme is summarised below, but be sure to check out the full line-up on their website. Thursday 29 April at 1pm // Now in her mid-seventies, broadcaster, journalist and campaigner Joan Bakewell is thoughtful and feisty. She’s talking over lunch in The Black Box. Tuesday 4 May at 1pm // Cruel and Unusual is comedian Keith Farnan’s hard-hitting show that “shows the death penalty in its true light – a barbaric, racist, politically motivated act of revenge that doesn’t achieve any of its so-called aims, including deterring violent crime”. Friday 7 May at 1pm // Tim Brannigan’s autobiography (soon to be available in book form) Where Are You Really From? is a startling story to tell of being hidden for a year after birth before his mum ‘adopted’ him rather than face the scandal of an extra-marital affair with a black junior doctor. A lunchtime of racial prejudice, sectarian tensions and family secrets. Saturday 8 May at 11am // Patrick Monahan is a 467 year old “story teller and flying carpet enthusiast” with an old tale to tell audiences from 5 to 105 who book to turn up in the Black Box Café. Monahan’s grown-up routine – Cowboys and Iranians – is in the Duke of York (or is it The Dark Horse?) at 8pm on the previous evening, Friday 7 May. Thursday 29 April at 6pm // The City Hall lawns host Mr Pejo’s Wandering Dolls and his magical Mogota performance as puppets come to life in a mysterious village fair. Friday 30 April at 5.30pm // “Belfast has had nothing of any architectural merit built in the past 50 years” said the text message read out on Good Morning Ulster earlier this year. Finola Meredith chairs the Architecture Debate in The Dark Horse. Ten well-known Belfast buildings will be presented and the expert panel and public audience will get to vote. Friday 30 April at 6.30pm // Cinema isn’t just the preserve of Belfast Film Festival. The film Art & Copy gets under the skin of the world of advertising in Doug Pray’s documentary being shown at the University of Ulster’s Belfast Campus. Friday 30 April at 8pm // If you missed Sharon Shannon at the St Patrick’s Day concert at the Waterfront, then you’ll find her playing with her four-piece band in the Festival Marquee for “a stomping, knee-slapping live show”. Saturday 1 May at 6pm // It’s Only a Movie with Mark Kermode is the chance to hear the iconic film critic’s best anecdotes live in The Dark Horse (30-34 Hill Street, BT1 2LB). Sunday 2 May at 3pm // Lumiere – emotive vocals from Éilís Kennedy and Pauline Scanlon in The John Hewitt. Tuesday 4 May at 8pm // Andrew Maxwell is back after a sold out show at Out To Lunch in January for a night of comedy in the Festival Marquee. Wednesday 5 May at 7.30pm // CQAF are showing the “poignant, funny and never less than fascinating” film Silver Jew in the Black Box Café. A no-budget documentary shot in three days that follows David Berman’s seminal band Silver Jews as they stop over to play in Jerusalem. Free. Thursday 6 May at 8pm // Bertie Ahern is the guest speaker at the third annual David Ervine Memorial Talk. Gerry Creen and Leah McConnell will provide the music. Thursday 6 May at 8pm // The Divine Comedy are playing in the Festival Marquee in Custom House Square. Saturday 8 & Sunday 9 May at 7.30pm // Nouvelle Carny Part 3 is “an absurd trip into the world” of “disobedient clowns, suffering acrobats and confused jugglers” down at the Belfast Circus School. Sunday 9 May at 3pm // Singer and flautist Nuala Kennedy and “her eclectic band of merry minstrels” playing in The John Hewitt. Also, watch out for the free gigs in The John Hewitt featuring Omagh’s Dirty Blues Band on Friday 30 April at 9pm, and Gareth Dunlop playing alongside “Canadian folk-punk accordionist” Geoff Berner on Sunday 2 May at 8pm. its challenge to the religiosity of many Christian denominations, and the formula that congregations follow along with her experience as a chef that intertwines food and bodies as she looks at the ideas of the sacrament of communion alongside running a food pantry (all on the same altar table). Well worth a read, even if it is uncomfortable in places and you don’t agree with all her theology – there’s no harm in being forced to defend or revise your beliefs! Miles continues to “sweep away the anxious formulas of religion” in her determination to transform others’ lives – as well as her own – by following what Jesus did: feeding strangers, loving and blessing those who have become like “non-people” in our communities. “When Jesus enters into relationship with outcasts and shares in their social death, he starts a process of resurrection. The unclean become full, living people, born again. They are reincorporated – that is, re-bodied – into the community. And the community is healed into wholeness from separation, made new. She brings readers back to the weekly food pantry at St Gregory of Nyssa Episcopal Church in San Francisco where tons of food are distributed from the church building, on and around the communion altar. Unlike much of the organised church, and in contrast to other food pantries Miles has visited, St Gregory’s isn’t hot on rules. It’s about inclusion, before it’s about exclusion. Drunks and junkies are welcome to volunteer as long as they aren’t high. It’s run by poor people, for poor people. “Russian and Greek Orthodox believers” as welcome to work as “Catholics, Hindus, atheists, Jews, Buddhists, agnostics, even an Episcopalian or two”. It’s as if Christians need to stop defending themselves and their culture and their rights, and instead stand up for other people’s beliefs first. Fight for the rights of Muslims, for the rights of gays, for those who want to speak and be educated in Irish, for those who want to be unified or remain in union with a different state to your own religiopolitical preference. Stand up for those who so often are oppressed, and perhaps the world will begin to believe that Christianity is worth defending too. Miles has been applying her growing faith and ever-expanding list of unanswered questions to other areas of life. Her experience of hospital chaplaincy is not one of “turning ordinary humans into miracle workers who say magic words over a sufferer and restore the sick to perfect health”. Prayer doesn’t cure, but it can bring about healing, particularly through becoming embedded in relationship with God and with other people. 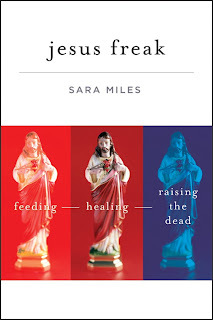 Having touched on feeding, healing, forgiving, Miles ends with a chapter on raising the dead. It centres around a terminally ill woman, Laura, her son Gabriel, and her friend Gloria. Gloria’s status as an illegal immigrant coupled with California’s Proposition 8 legislation would mean she’d be likely to struggle – legally – to look after Gabriel once Laura died. Society defines family by what it excludes. In the end, there was new life for Laura, Gabriel and Gloria. It’s not a book that quotes the Bible every second sentence, but the principles it highlights clearly fall out of the Gospel narratives. Sara Miles is unorthodox. She’s hands on and practical. She loves Jesus, and loves people. She doesn’t wait to find clarity and perfection in the mess of this world. She believes that God gives her all the permission she needs to feed, heal, forgive and resurrect people she meets. Video excerpt below from Sara Miles speaking about her new book at San Francisco’s Grace Cathedral. I wish Mark Thomas still had his show on Channel 4. I miss his left wing take on life as well as his ability to expose and amplify the weaknesses of corporations and governments. Luckily he still writes books and apparently he still pops up on Radio 4, though I've yet to catch any of his shows. 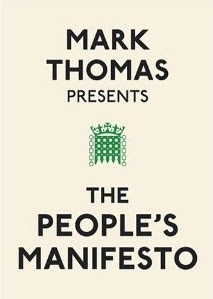 The People's Manifesto is a short book published at the conclusion of Thomas' 2009 It's the Stupid Economy tour and a couple of radio shows. He toured the UK asking audiences what polities they'd like to see implemented, and held a vote at the end of each evening. A selection of the winning policies were published. The book's publishers Ebury Press have put up the £500 deposit and £500 towards campaign expenses for Danny Kushlick to stand as an independent candidate in Bristol West. "4x4 drivers should be forced to drive everywhere off-road, even to Sainsburys." "Anyone with a 4x4 in a city must also volunteer for the nearest mountain rescue service." "Those in favour of ID cards should be banned from having curtains. Those with nothing to hide have nothing to fear." "Goats are to be released on to the floor of the House of Commons (no more than four); MPs are forbidden from referring to them ever." There's a lot of common sense in amongst the more random and surreal suggestions from the public. While understanding that the issue is complicated, I have a sympathy with the ten reasons to legalise drugs, though Thomas always finds a way to comically cut through the mature analysis. "Illegal drugs are often impure ... cocaine is cut with baby milk powder, making life very difficult for liberals boycotting Nestle products." The audiences had much to say about MPs. "MPs should have no job other than that of MP ... There are few other jobs in the public sector where people are encouraged to moonlight as part of their job description. You don't see many teachers abandoning a class to give a speech for Swiss banking conglomerates, declaring, 'If all I did was teach you'd end up with very bland teachers.'" The policy suggested and voted for by the Northern Ireland audience was a series one. "To introduce the 1967 Abortion Act into Northern Ireland ... I confess to being shocked whem the Belfast audience voted for the policy ... Until then, I thought that Northern Ireland operated under the same rules as the rest of the UK. But no, the law that applies in Belfast is the 1861 Offences Against the Person Act, a statute that was created before women could even vote, let alone voice concerns over their reproductive rights. This law is so antiquated that Section 26 of the Act makes it an offence for a master or mistress to inadequately feed or clothe a servant." "... the British government is willing to support the fight for abortion rights around the world [through the Department for International Development] - just not in Northern Ireland, the one place where they could make most progress really, really easily." "The garment trade should print the age of the person who made each item in the label ... Perhaps surprisingly, 'cheap' doesn't always mean lowest standards: the 2009 report by Labour Behind the Label gave Gap and Primark a better write-up than Debenhams and John Lewis." "To introduce 'None Of The Above' on ballot papers." This would allow constituency elections to be re-run with "proper candidates" if the public disapproved of the selection, and it might help politicians and parties "to reconnect with the electorate in the prospect of losing to an empty chair". Part two of the preview of the upcoming Belfast Film Festival. If cinema isn’t your taste, there’s also the Titanic Made in Belfast festival (3-11 April), the Cathedral Quarter Arts Festival (29 April-9 May), Belfast Children’s Festival (21-30 May) as well as the Festival of Fools (29 April–3 May) and many, many more! 10am, 1pm, 3.30pm, QFT – Short Film Competition – Three two-hour sessions featuring short films by (Northern) Irish film-makers from 3 minute to 20 minutes long made in the last year. 8pm, Bff Beanbag Cinema – Post Apocalyptic Film Night / The Quiet Earth – Following a short episode from The Twilight Zone, the main event is a screening of the 1975 cult classic The Quiet Earth where Zac wakes up and finds that his government project has accidentally killed everyone else on the planet … until he discovers other struggling survivors. 9pm, QFT - 5 Day Shelter – Five characters, five days. Can they get beyond quiet desperation and isolation to reconnect with the beauty around them? World premiere. 8pm, Spectrum Centre – Shankill – A 1994 film presenting “a candid portrait” of the hopes and fears of ordinary working class people living on the Shankill. Followed by a Q&A. 7.15pm, QFT – Metropia (15) – 2024. Europe is running out of oil and faces financial collapse. A paranoid call-centre worker is forced to ride on the underground system (that spans across the continent) and has to fight against the voices in his head. Acclaimed for its style of photo-montage animation. 7.30pm, Black Box Café – The A-Z of Belfast Cinemas – Brian Henry Martin talks his way around one hundred years of cinemas in the city, through the sixty venues and countless stories. 9.15pm, QFT – Winnebago Man (PG) – Jack Rebney made corporate videos to promote Winnebago touring vans. However, his outtakes became internet sensations. Film-maker Ben Steinbauer tracked down the irascible legend to make a hilarious, moving and at times foul-mouthed film. 8pm, Bff Beanbag Cinema – The Fabulous Baron Munchausen (PG) – A Czechoslovakia special-effects and visual masterpiece, opening with a modern-day cosmonaut confronting pioneer space traveller Cyrano de Bergerac on the moon! 8pm, John Hewitt Bar – 9th Belfast World Pong Championship – It’s not a film, but it’s an annual part of the film festival. Old-fashioned electronic Pong, played out on the big screen. Contact the box office if you want to book a space to play. 9.30pm, QFT – Symbol (15) – “A Japanese man wakes up alone in a brightly illuminated white room with no windows or doors. When he presses a protuberance that appears on one wall, a pink toothbrush materializes from nowhere, clattering to the floor and setting in motion a genuinely bizarre chain of events. Soon the imprisoned man is engaged in absurd and hilarious attempts to escape the gleaming room.” Intrigued? I am. 6.45pm, QFT – The First Movie – Critic, and now film-maker Mark Cousins took his mobile cinema to a northern Kurdish village in Iraq. Handing out digital cameras to the children, their highly creative filming (including “a continuously held camera shot … [a] revealing fable of a boy who, without friends or toys, [who] confides his hopes, dreams and thoughts to the mud) is included in this war zone documentary, as Cousins reflects on his own childhood in Northern Ireland. The film will be introduced by Mark Cousins. 7pm, QFT – Tsar (15) – 16th Russia, Ivan the Terrible sees the Last Judgment approaching. During his reign of terror he faces opposition from his friend Philip, the superior of a monastery. A clash of cultures and ideologies. Superb cinematography. 8pm, First Church of Christ Scientist, Rugby Road, Belfast – The Prisoner – Catch the screening of an episode of the original series of The Prisoner (before the new series starts on ITV) in an unusual venue. The First Church of Christ, Scientist was designed by architect Clough Williams-Ellis, who was also responsible for the seaside village of Portmeirion used as the backdrop for The Prisoner. Followed by a talk on Williams-Ellis and the importance of architectural heritage in Belfast. 9.30pm – QFT – 1 (15) – Set in a bookshop in which all the rare books have been replaced with copies of a book called “1”, the story of “the fate of humanity in one minute”. Based on an essay by the Polish science fiction author Stanislaw Lem (who wrote Solaris). Thought provoking, but with a mysterious plot. 6.45pm, Dublin Road Movie house – Tetro – A personal yet fictional film from Francis Ford Coppola following one brother searching for his older brother in Buenos Aires before grappling with their shared past who has been missing for over a decade. Black and white. Belfast Film Festival kicks off in just over two weeks time. If you haven’t already perused the programme and booked your tickets, now is the time. I attended a few films and events last year and am hugely looking forward to this year’s selection of cinematic treats. The programme is brimming with tantalising treats. I’ve split the post in two – this one covers my highlights from the 50 or so films being shown in the first week of the festival. I hope I catch at least a few. Update - Part two now posted too. 7pm, QFT – Empire (PG) – Based on the Greek myth Orpheus and set in Belfast where a wandering fool meets a vaudevillian can-can dancer. World premiere. 3pm, QFT – Mia and the Migoo (U) – Animated fantasy adventure based around a young girl’s mission to protect a sacred tree that is threatened by the construction of a lavish island resort. Can the Migoo creatures help Mia save her father, the tree and the future of the earth? 3pm, QFT – Mia and the Migoo (U) – see Saturday 17 April. 8pm, Bff Beanbag Cinema – Mix Up (PG) – Based on the true story of two babies switched at birth and brought up by the wrong parents. Twenty years the two women discover. Never mind the original mix up, the film promises a mixed up bag of styles, cultures and footage. 7pm, QFT – Bluebeard (Barbe Bleue) (15) – A tale within a tale. Two sisters sneak up to the attic to read a fairytale. But inside the fairytale, one sister is compelled to marry Bluebeard to lift her family out of poverty. 9.15pm, QFT – The Living Room of the Nation – Seventy five minutes of observing different Finnish living rooms. Could be tedious? Or it could bring you hilarity, danger, commitment and love, as well as an insight into Finnish life. 8pm, Culturlann – The Puzzles of Paisley and The Two Traditions: Myths & Fears– Authors and journalists comment on the “Ian Paisley phenomenon with the help of RTE archives” followed by a 1991 film that depicts the “cultural fears and stereotypes that existed at that time”. Followed by a Q&A. 7pm, Dublin Road Movie House – Cup Cake – Shot in Ballymoney, this ultra-low budget film looks at a bakery inherited by a son who isn’t a natural baker; building robots; a foreign love interest; and a promise kept and a heart followed. 8pm, Spectrum Centre – The Puzzles of Paisley – Authors and journalists comment on the “Ian Paisley phenomenon with the help of RTE archives”. Followed by a Q&A. 9.15pm, QFT – Mickey B (15) – An adaptation of Macbeth cast by prisoners serving in HMP Maghaberry. The three witches are bookies. Followed by a Q&A with the Director and one of the cast. 8pm, Spectrum Centre – Change of Address – 1975 BBC NI documentary about the proposed Belfast Urban Motorway around the city that never went ahead. The problems of Divis Flats, Shankill Road depopulation and Springmartin discussed. Followed by a Q&A. 7.15pm, QFT – Hamely Tongue / Cultúr Ceilte (Hidden Culture) – Puts forward a “more nuanced perspective on the language and culture of Ulster Scots” and tries to find common ground between Ulster Scots and Irish. Followed by Q&A. 9pm, QFT – Last Train Home – Imagine leaving your children in rural China with a grandparent while you go and work hundreds of miles away in an industrialised city, only returning once a year at Chinese New Year to see them. But feeling abandoned, your teenage children may rebel. This is the story of over 100 million Chinese workers. 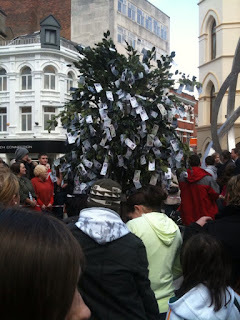 Maundy Thursday hits Cornmarket? Qu'est-ce que c'est? So what is it? What were they doing? Thanks to Destroy All Onions for the photo from Cornmarket Arthur Square this lunchtime.